Use Gravity Boots with EZ-Up Rack, Inversion Bar and the EP-550, EP-550 Sport. One Size Fits Most: Boot straps adjust to ankles varying several inches in diameter. 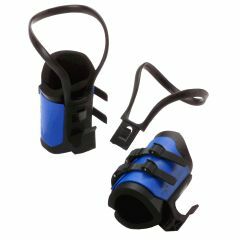 Removable Calf Loops: Add comfort by placing a two-degree bend in the knees to help reduce the load on knee joints and the top of the foot. Easy To Use. Compact. Sturdy. Targets Muscles.